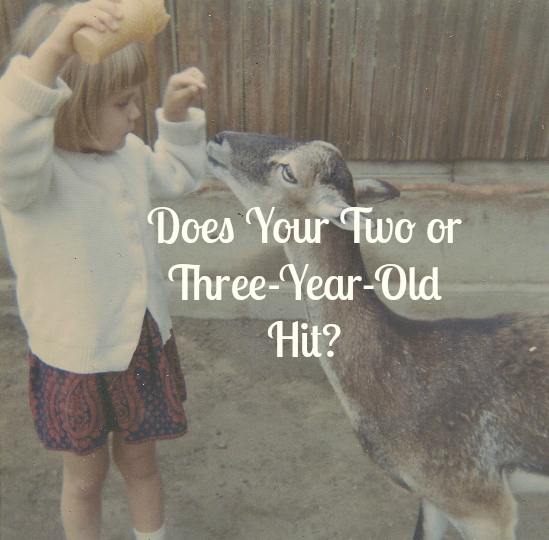 Does Your Two or Three-Year-Old Hit? 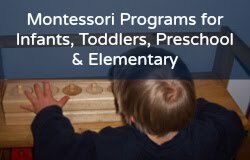 I was a Montessori teacher for over twenty years, and I started blogging in 2008! Over that period, I have received a lot of questions about young children and hitting, especially two- and three-year-olds. What to do? How can you handle it when your two or three-year-old hits? Let's start with toddlers and time outs: I don't think time outs are very effective for toddlers at home or in a school or daycare setting. (We did not use them at our preschool.) Instead, the toddler needs help to use her words and express her feelings. But what about at home? At home time outs can be a way of dealing with extreme behavior, like hitting, but there are better methods you can try that are age-appropriate. When your child hits, direct her to an activity that she can hit, like a special pillow, some play dough, or a toy hammer activity and say, "We can hit the pillow or the play dough..." Also tell her "Hitting hurts, it makes me feel sad." And The sooner you deal with hitting behavior, the better, as the hitting will persist, and three- and four-year-olds hit harder, scream louder, and run faster! So tackle it now! "My three-year-old son is going through a hitting phase, especially with his six-year-old sister. He now walks by and smacks her or hits her out of the blue while playing..."
Three-year-olds want to be more social. This is typical as they begin a new stage of development which is to make friends--the drive is VERY STRONG. But, they might not have the "social skills" necessary for success! "I feel like a broken record of telling him how hitting hurts and giving him examples of gentleness and kindness." "I am wondering if you have any tips on how to manage this new behavior." I suggest reading the book Hands are not for Hitting to your child. If you have pets: Tails are Not for Pulling. And if you have a biter: Teeth are Not for Biting. They are all written by the same author, Martine Agassi. Storytelling: In our preschool we gave puppet shows every day at story time, and we acted out the issue of the day with the puppets. If a child was hitting instead of using words that day, we would reenact it using the puppets! And the children often did their own puppet show and copied the teacher! There is a wonderful book about using stories for challenging behavior called Healing Stories for Challenging Behaviour. It is a great indirect way to deal with issues in the home and in the classroom!